It takes a lot of work to get ready for a family trip, even if you have a travel agent doing the planning and booking for you. Choosing the right places and activities, all while trying to maintain some semblance of your normal routine, especially if you have younger kids — can be a real challenge. In the hectic pace of everything, it can be easy to forget the bigger reasons families choose to travel with their children: to enrich their lives, expand their emotional and cultural horizons, and help them become better global citizens. So it’s great to encourage kids to be involved in the planning and to participate in family activities — but what are some ways that you can really get your child curious about your travel destinations without adding yet another list of to-dos to a parent’s already-long list? Here are some ideas for sparking the love of travel in your child on your next vacation. Use your child’s natural interests to make a destination come alive. Does your kid love painting? Music? Dance? Sports? Animals? Have your child research ahead of time about activities or places that might speak to his existing passions. Maybe the place you’re headed has an incredible soccer culture, or was the home of a famous photographer. Maybe it’s known for a certain kind of food, or has some quirky museum. Have him gather as much info as he can, and let him choose a way to dig deeper into that interest — a play, an exhibit, a match, a festival. Use a travel journal. If your child likes to write or draw, this can be both a wonderful way to document experiences and a way for kids to have alone time if they need it, or wind-down time in the evening before bed. Set aside even just 10 minutes for them to write down or doodle something from the day. A journal can be used before leaving, too — it can be a place where a child documents questions she has about where you’re going, things she wants to learn, a place to glue in pictures of places she wants to see, things she’s excited to try. Try a scavenger hunt. How many kinds of gelato can you try? How many colors of cowboy boots can you spot? Can you track down all the famous buildings built by a favorite architect? Make a list of landmarks that were important to a local band? This is something that can be adjusted for younger and older kids, and can be an effective way to engage older kids especially. It keeps them tuned in more, and there can be a reward when a “list” is completed — dinner of their choice, for example. Use photography as a way to help them pay attention. For a kid who loves photography, the lens can be an excellent way to help ignite curiosity and help them be present to the travel experience. For younger children especially, an inexpensive disposable camera works just great and can make them feel very grown up; older children might have access to a simple digital camera or a phone with a built-in camera. They might choose to just photograph whatever strikes their interest, and that’s fine — but they can also decide ahead of time to keep an eye out for something specific: interesting flowers, unique doorways, motorcycles or scooters they like, desserts, street signs, gardens, markets, sunsets. Being aware of and respecting cultural etiquette around taking photographs, of course, there are tons of incredible creative opportunities. This can be a wonderful way for a child to discover a new interest he didn’t even know he had. If you choose to go the digital route, you can even set up an Instagram account specifically for your trip if you like, and your child can use a smartphone as her camera. This is a great way to visually and verbally record what they’ve seen and experienced. They can use it to build vocabulary in a new language by photographing an object, asking a local what it is, and then labeling the image with the word and its translation. If your child doesn’t enjoy traditional journaling as much, this can be an alternative way to have time set aside each day for remembering, documenting, and processing in a different medium. Having an Instagram account also offers a wide variety of ways to print off and use selected favorite images — photographs, magnets, prints. And your child can use the Postagram app to instantly and inexpensively send postcards of the trip to friends, family, or back home again. Use a recorder to capture new sounds, voices, and music. If your child is more aural and visual, you can use a small digital voice recorder to capture the unique traits of your destination. Car horns, street music, sounds of natural surroundings, food cooking, traditional ceremonies, language, laughter — all of these paint an auditory picture of your vacation that will spark wonderful memories for years to come. Again, if your child doesn’t enjoy traditional journaling, keeping a recorded journal might be just the thing that will really spark his interest. Use the power of compare and contrast to sharpen curiosity, create awareness, and start good conversations. Have as a goal each day — and this can be something the whole family can do — to note one thing that’s similar to what you do at home, and one thing that’s different from what you do at home. Do kids play similar games? Eat different foods? Drive the same cars? Wear the same kids of clothes? Listen to different music? Have the same kinds of pets? In addition to observing similarities and differences, talk to them about their thoughts around what they’re noticing. What questions come up? What’s comfortable for them, and what feels totally unfamiliar? Do they see things that they wish kids did more of back home? This can be a powerful tool for kids to be present to what’s happening around them, and can help them process the culture shock that can accompany the newness of various environments, as well. It can be a way for you to get to know them better, and it can be a way for them to understand more about themselves, too. An added bonus with these ideas is that they don’t really require any additional management or planning on the part of a parent. As with any other trip, each family will have to establish ground rules and be aware of the cultural expectations of the places they’re visiting. 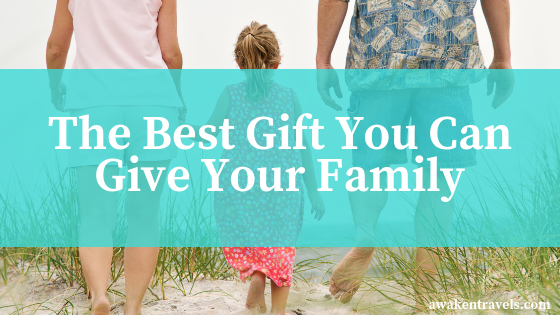 But other than setting aside some quiet time each day, which most families need, anyway, these activities are largely child-driven and executed. Yes, you’ll likely have to help your kid plan or reserve tickets for a chosen activity or event — but that’s something you would be doing for that day, anyway. The difference here is that your child will be a part of the process. And, yes, you’ll likely be stopping a little more as your child notices, points out, and talks about everything she’s taking in — but in the end, that seems like a wonderful opportunity for connection with your child, and a chance for parents to slow down and absorb a little more, too. Traveling with your children provides a one-of-a-kind educational experience for them, and a powerful bonding experience for the whole family. I would love to help you design the perfect travel experience for your family! Click this link to start planning your family’s next great adventure.